ISTJs are often revered for their attention to detail, their meticulous nature, and their loyalty and sense of duty. But what we don’t often hear are the kinds of things that make them light up, bring them joy, and provide a sense of satisfaction in their lives. I’ve spent the last few days speaking to as many ISTJs as I could, and with all their feedback I compiled a list of things that truly excite them. I hope you’ll enjoy this! ISTJs enjoy the peace of mind and space for reflection that they get from being alone in natural surroundings. They consistently mentioned how much they enjoy observing scenery and animals, and soaking in the beauty and fresh air of more remote, tranquil settings. A feeling of accomplishment was a strong satisfier for ISTJs. They tend to be hard workers and feel most excited when their to-do list is accomplished and they can finally relax. When all their hard work is finished, ISTJs enjoy a leisurely nap to refresh themselves. As introverted sensing dominant types, ISTJs are keenly aware of their inner physical states. Exhaustion, fatigue, hunger and thirst can all impact them more strongly than many other types so it’s important for them to get enough shut-eye! Having a place for everything and everything in its place is very important to ISTJs. Creating order out of chaos gives them a sense of satisfaction, and being able to look around and see everything properly stowed in an efficient way gives them a thrill! ISTJs enjoy having a plan and a consistent routine, but as introverts they still get joy from having a weekend to themselves (or an hour if that’s all they can manage). Having free time to follow whatever interest sparks their curiosity is invigorating to them. ISTJs tend to be intensely aware of the flavors and quality of food. They often enjoy cooking and customizing recipes to their specific tastes. They tend to have very particular tastes and favorite restaurants they enjoy visiting again and again. As introverted sensors, ISTJs are deeply aware of physical sensations and comforts. They love sliding into a freshly-made bed, complete with high-quality, fresh-smelling linens. ISTJs enjoy learning as much as possible about whatever subject piques their curiosity. They are specialists who enjoy having big chunks of time to dedicate to their hobbies and projects. They enjoy reading, looking at manuals, and perusing articles online. ISTJs believe that if they’re going to do something, they should do it meticulously and well. They enjoy the feeling of closure that comes from finishing a project and knowing every detail is perfect. They enjoy getting to the end of the day knowing they put in their best effort. This one came up surprisingly frequently. ISTJs consistently mentioned that they enjoyed the smell of rain, cool breezes, and peacefully absorbing it all (often while reading a favorite book). Do these 10 things bring you joy? Is there anything else you would add? Let us know in the comments! You can also follow me on Facebook, Instagram, or Twitter! 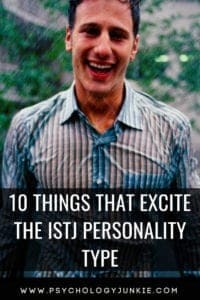 As uncomplicated as we look on the outside, an ISTJ is often considered the most internally complex personality type. Even we don’t know what pages are in our book sometimes.